Although the vehicle had originally been designed as a stopgap while larger, more advanced tanks were developed, it nonetheless went on to play an important role in the early years of World War II, during the Polish and French campaigns. The Panzer II was the most numerous tank in the German Panzer divisions beginning with the invasion of France. It was used in both North Africa against the British and on the Eastern Front against the Soviet Union. The Panzer II was supplemented by the Panzer III and IV in 1940/41. Thereafter, it was used to great effect as a reconnaissance tank. By the end of 1942 it had been largely removed from front line service and it was used for training and on secondary fronts. Production of the tank itself ceased by 1943 but its chassis remained in use as the basis of several other armored vehicles, chiefly self-propelled artillery such as the Wespe and Marder II. Continued development of the reconnaissance tank concept led to the much up-armored Ausf. 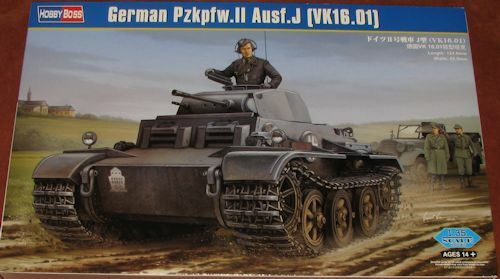 J, which used the same concept as the Pz.Kpfw. IF of the same period, under the experimental designation VK 1601. Heavier armor was added, bringing protection up to 80 mm on the front and 50 mm to the sides and rear, with 25 mm roof and floor plates, increasing total weight to 18 tonnes. Equipped with the same Maybach HL45P as the Pz.Kpfw. IF, top speed was reduced to 31 km/h. Primary armament was the 2 cm KwK 38 L/55 gun. 22 were produced by MAN between April and December 1942, and seven were issued to the 12th Panzer Division on the Eastern Front. This is the second of these mid-war recce tanks that has been done by Hobby Boss. I have to say that I like the look of it. With its interleaved road wheels and saggy track, it looks like a baby Panther. Of course it is not heavily armed, having but a 20mm gun for its main armament, but the more modern turret certainly adds to its appeal. The kit has a one-piece lower hull onto which you place the various suspension and drive components as well as the side escape hatches. The road wheels need to be put on in a specific sequence. 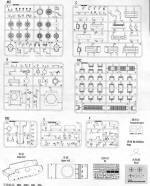 This kit has link and length tracks which I think that many modelers would rather deal with than the individual link variety. 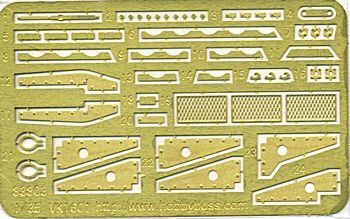 Included in the kit is a photo etch fret that is used for screens, handles, mounts, straps and braces to name a few things. It is integral to the build. The transparent bits are on a clear acetate sheet with the parts nearly fully punched out. You just have to make a couple of cuts to use them. A section of string is included to use for the tow rope. The turret is nicely done with a nearly full piece upper section into which the guns will be placed. These guns are complete, but there is no turret or tank interior. The hatches are designed to be closed, despite what the box art might imply. 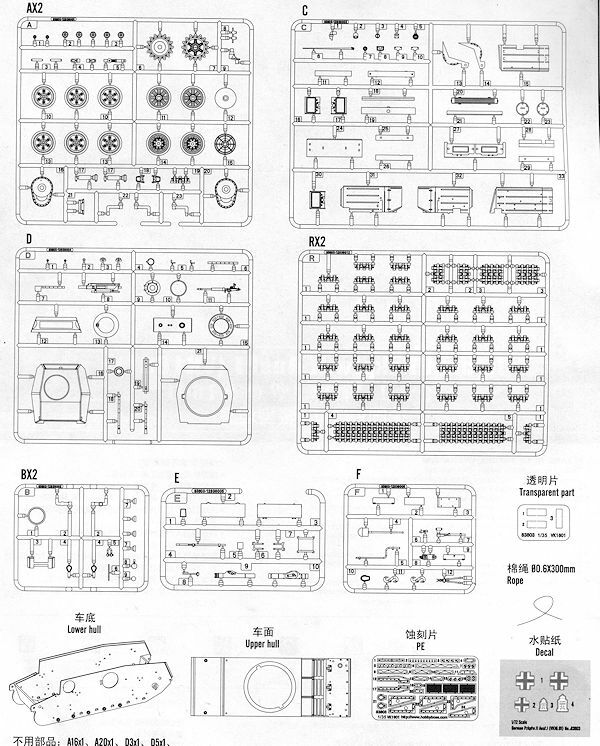 Kit instructions are well done with clearly drawn construction steps; nine in all. Markings are for one vehicle as shown on the box top in Panzer Grey from an unidentified unit, though if the history section is to be believed it is with the 12th Panzer Division. The small sheet (not shown) includes insignia and the division logo. To be honest, I'd never heard of this variant before seeing this kit and researching it. However, it does look like a very nice light recce tank and will add interest to your armor collection. Thanks to Squadron Products for the preview kit. You can get this one today at your local retailer or have them order it for you.